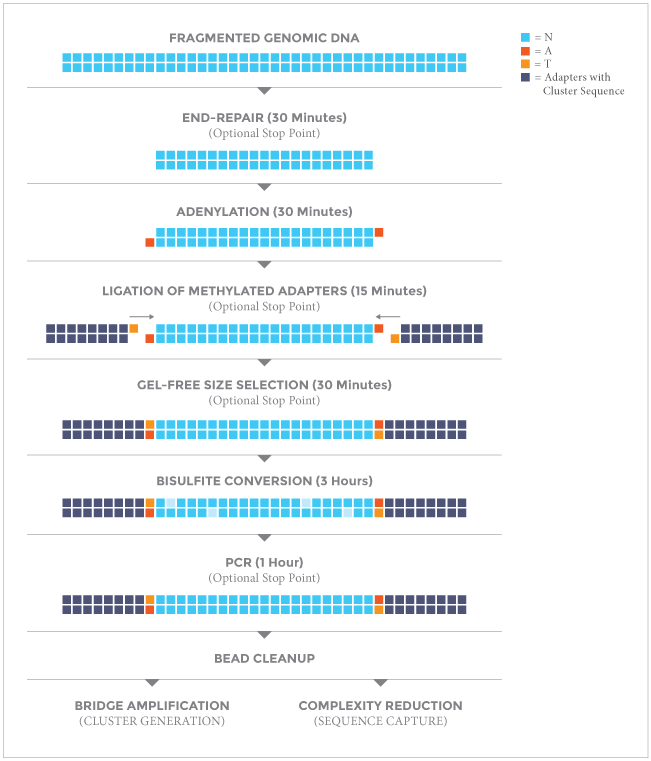 The NEXTFLEX® Bisulfite-Seq Library Prep Kit is designed for both reduced representation bisulfite sequencing (RRBS) and whole-genome bisulfite sequencing (WGBS). 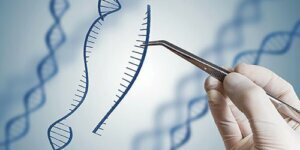 It generates single, paired-end and multiplexed DNA libraries for sequencing on Illumina® platforms. The NEXTFLEX® U+ Polymerase Mix included in the kit is able to read through uracil present in DNA templates and has been optimized to amplify bisulfite converted templates. The NEXTFLEX® Bisulfite-Seq Kit is a versatile kit designed to facilitate assessment of the methylation state of the genome and simplify workflow by using master mixed reagents and magnetic bead based cleanup to reduce pipetting and eliminate time-consuming steps in library preparation. In addition, the availability of up to 24 methylated NEXTFLEX® Bisulfite-Seq barcoded adapters makes multiplexing simple. This kit features Enhanced Adapter Ligation Technology, resulting in library preps with a larger number of unique sequencing reads. This specially designed NEXTFLEX® ligation enzymatic mix allows users to perform ligations with longer adapters and superior ligation efficiencies. The NEXTFLEX® Bisulfite-Seq Kit with reduced representation utilizes a restriction enzyme that leads to selective amplification of CpG regions, resulting in focused sequence depth. The NEXTFLEX® Msp1 Restriction Enzyme, which is available separately, has been optimized for reduced representation studies using the NEXTFLEX® Bisulfite-Seq Kit. The NEXTFLEX® Bisulfite-Seq Kit can also be used without the MSP 1 Restriction Enzyme for genome-wide methyl-seq analysis, including under-represented CpG regions. 10 ng – 1 µg of fragmented /or/ Msp1 digested genomic DNA in up to 40 µL nuclease-free water. Bewick, A., et. al. (2016) On the origin and evolutionary consequences of gene body DNA methylation. PNAS. 113: 9111 – 9116. Ramesh, V., et. al. (2016) Loss of Uhrf1 in neural stem cells leads to activation of retroviral elements and delayed neurodegeneration. Genes & Development. 30: 2199 – 2212. Satgé, C. et. al. (2016) Reprogramming of DNA methylation is critical for nodule development in Medicago truncatula. Nature Plants 2, 16166. doi:10.1038/nplants.2016.166. Do you have protocols available for whole-genome bisulfite sequencing or reduced-representation bisulfite sequencing? Yes, the NEXTFLEX® Bisulfite-Seq Kit can be used for either WGBS or RRBS. How much input DNA can be used with the NEXTflex Bisulfite-Seq Kit? 10 ng -1 µg of fragmented genomic DNA (for WGBS) or Msp1 digested genomic DNA (for RRBS) in up to 40 µL nuclease-free water. How many samples can be multiplexed using the NEXTflex Bisulfite-Seq Kit? Are the indexed adapters available separately? The methylated NEXTFLEX® Bisulfite-Seq Barcodes are recommended for use with the NEXTFLEX® Bisulfite-Seq Kit. To offer greater flexibility, these indexed adapters are sold separately from the library preparation kits in sets of 6 or 12 unique barcodes. The 8 reaction size of the NEXTFLEX® Bisulfite-Seq Kit (cat # 5119-01) does contain a single adapter for those customers who do not need to multiplex samples. The other barcode kits we offer are not methylated and are not compatible with bisulfite sequencing. Do you recommend a bisulfite conversion kit? What is the general efficiency of bisulfite conversion using the recommended bisulfite conversion kit? Conversion efficiency generally exceeds 99% using the EZ DNA Methylation Kit. The NEXTFLEX® Bisulfite-Seq Kits contain enough material to prepare 8 or 48 genomic DNA samples for Illumina® compatible sequencing. The shelf life of all reagents is 6 months when stored properly. DNA Binding Buffer and DNA Wash Buffer should be stored at room temperature. All of the other components can be safely stored at -20°C.